About 15 minutes off of I-65, across the beautiful Tennessee River, I learned some history, admired a business and ate some fantastic food. Chicken and white sauce at Big Bob Gibson’s Bar-B-Q in Decatur is my MEGabite #22 or 79 on my countdown. 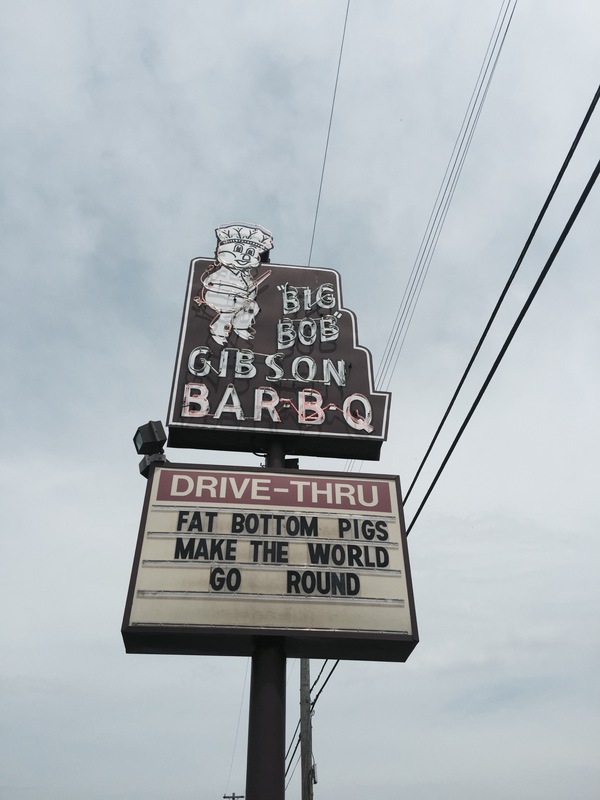 This food story begins in the 1920’s, with the founder, Big Bob Gibson, so named because of his 6’4” 300 lb frame. He was a railroad worker who made his mark that has endured for generations. At this time, it was common practice to use vinegar or mustard based Carolina style barbecue sauces. Big Bob came up with the idea to use a mayonnaise based sauce that also included; vinegar, apple juice, horseradish, lemon juice, cayenne and black pepper. Big Bob dug a hole in the ground and began to cook whole split chicken low and slow over local hickory wood. When finished, the chickens were dipped or in the words of his grandson, “baptized” in white sauce. It is said that on the weekends, people followed their nose and drove down a dirt road in the country to eat this delicious chicken and sauce. As the visitors increased, boards were nailed to the trees for tables and a business was born. Bob left rail work and followed his talent. This dish was not to be a passing trend and today this white BBQ Sauce is known as a North Alabama regional specialty. In the 1950’s, his daughter propositioned him to go halfsie into the restaurant business. Over the years, new dishes have been added to the menu, including their famous pies, also on “The 100” list. I chose Mac and cheese and beans for my sides and dug in. At some point in time, a competition team was formed. 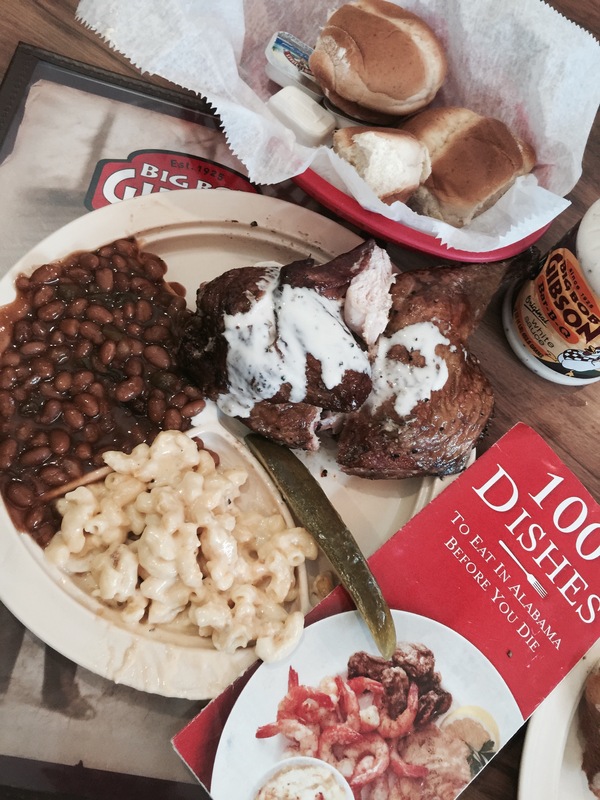 This dish has helped Big Bob Gibson Bar-B-Q get onto a world stage. The award list is long and I point out a few that I saw on the walls. Grand Champion at the 2004 American Royal Barbecue international contest. 80 years later and four generations of this family have continued this North Alabama tradition. I learned that his grandson and great grandson in-law (I think I got this relationship correct,) made a red-based sauce due to customer requests for a sweet red sauce. Over a 6-month period of trial and error, the tow men combined their recipes. In the footsteps of Big Bob, this sauce also has won first place at a competition. Very successful, the sauces are bottled and distributed to more than 2000 grocery stores in eight states. Locals use this sauce as a marinade, basting, and table sauce. A successful catering business with a mobile catering truck was added. They have catered to more than 3000 plates. I wonder if Big Bob would have imagined this success, great story. ****For great food with great service, clean and interesting restaurant, super website and a fantastic business story. The 5th MEGastar * for meeting the criteria of folks who are dedicated to local food served with Alabama pride, and a sauce that is uniquely Alabama. A stop not to be missed! http://bigbobgibson.com/ A fantastic website that includes grilling videos that I plan to watch further. Can’t get there? You are able to buy the sauce and a cookbook on the website. Need an interesting gift for your favorite BBQ enthusiast? The website shows fun gift baskets with sauces, rubs and a cookbook. Drive that I-65 corridor? This is a pretty easy side trip. Play the !00 Dishes game as I do? Get the pie, it is also on the “100 List” and will be my next Tasty Tuesday write up. If that does not fix your sweet tooth, The Morgan Price Candy Cpo., is next door. You may pick up The English Toffee, also on “The 100” List #21 MEGabite. MEGabites-MEGastar Descriptions. Found after each of my 100 Dishes posts. If you are new to my 100 dish posts, this may be of interest to you. *100 Dishes to eat in Alabama before you die is a compilation of food to chow down on Bama style. Thanks to Tourism Alabama, www.alabama.travel my Alabama bucket list just became a little easier. I am going to have some fun while making my way like Ms. Pacman, in yet another state that I call home. You too may pick up the brochure at Alabama Tourism stops or download the alphabetical brochure that begins in Abbertville and ends in York. From the little old diner to the white cloth joint, it is an opportunity to explore and experience pride in the food from restaurateurs who are dedicated to local food with some Alabama style. From the localBBQ cook to James Beard recipients, you too will take a culinary trip across scenic Alabama. To note, there is about 231 dishes on this list and not 100. Some restaurants have been closed and others seem to appear on the fun app that you may download for your phone. I use my own 5 MEGastar system. I am not a food critic, just Meg, a curious traveler, with an interest in trying interesting Alabama foods, and sharing my two cents on my experinece. I began to use this system after a stop that wasn’t good so that I may be as fair as possible to the wonderful dishes that have been chosen for this list. One * MEGastar-“meh” food. To me,the dish just wasn’t good. Not the kind where the cook could have had a bad day, those days happen. But, maybe the food came from a can, perhaps the place was beyond grubby. I like put myself in the shoes of a tourist or a visitor; if I simply do not feel comfortable sending folks to a place that I feel does not show Alabama pride. An example, would I send an out of state visitor to try a yucky dish in a nasty place just because the place or dish once had it goin on? No. This unfortunate situation has happened to me a few times on my stops. It is uncomfortable for me to write about these experiences. ** MEGastars-passable. The dish was just ok but the place was interesting. Or, the place was interesting but the dish was not so good. **** MEGastars-Very good dish AND meets one of the definitions set forth by Alabama Foods/Tourism, of local food . And/OR highlights Alabama Pride. ***** MEGastars-I actually died, went to heaven and came back when I ate the dish. OR, something very unique, something you may not find anywhere else.